Austerity’s chickens are coming home to roost. In the final days of this general election campaign, Theresa May wants to trumpet her supposed commitment to keeping Britain secure. She wants to accuse Jeremy Corbyn of taking the side of terrorists and opposing legislation to keep Britons safe. But instead, she’s facing an onslaught of questions about why she, in her six years as home secretary, presided over extensive cuts to the police service, reducing the number of officers and seriously undermining neighbourhood policing. The public are looking for answers and, rightly, are demanding that the prime minister — who has done more to shape policing in Britain today than any other politician — answer her fair share of questions. We all know the PM doesn’t like scrutiny, she doesn’t like having her policies questioned. That’s why she’s refused to take part in any televised debates during this election campaign. But on police cuts, it’s not like she didn’t have fair warning. In 2015, the Police Federation — which represents 120,000 of the nation’s officers — warned the then-home secretary that ‘cuts have consequences’. Indeed, that was the theme of their annual conference, at which May spoke. 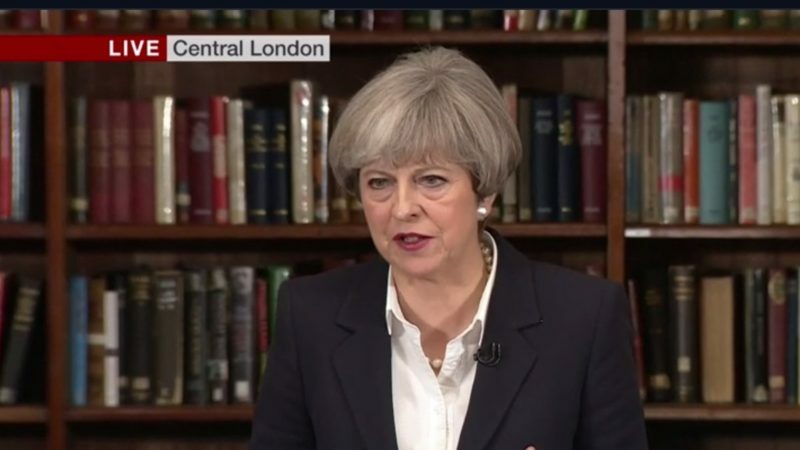 But instead of taking their concerns seriously, and bringing them back to cabinet, she delivered a blunt rebuke, accusing the federation of scaremongering. “I know that the theme of this year’s Police Federation conference is “cuts have consequences”. I know too that delivering more with less can be challenging and difficult. Over the past five years, we have had to make some tough and difficult decisions. We have reformed your pay and pensions, reduced police spending, and yes, there are fewer officers overall. But – despite the predictions of the Federation, and despite the predictions of the politicians who wanted to sell you a false dream of ever more spending – crime is down by more than a quarter since 2010, according to the independent Crime Survey for England and Wales. This is a classic Tory approach to dispute resolution — lecture rather than listen to those who understand what your policies are doing. It has its mirror image in Jeremy Hunt’s refusal to listen to the warnings of NHS staff. The Tories are so committed to their ideological austerity project that they refuse to accept dissent, even from those who are seeing the consequences on the front line. As home secretary, May made a choice to pursue the cuts agenda against the advice of police officers. She must now accept that choices — like cuts — have consequences. Niamh Ni Mhaoileoin is editor of Left Foot Forward. Follow her on Twitter. The arrogance of this lying, self-serving idiot is incredible. She is making the extremist M.Thatcher look like a moderate. In my mind she is a complete and total failure in politics and the worst example possible to the younger generations. Obviously her upbringing as a so called Christian has had not one jot of influence on her behaviour now. A truly vile creature. Will. I agree. My memory goes back to Harold Macmillan, and May or may not is the worst PM I have ever seen. let’s hope some polls are right, and we can give her P45 on Thursday.